Chelsea’s new manager Maurizio Sarri is reportedly unofficially blocked from raiding his old club Napoli in the transfer market this summer. 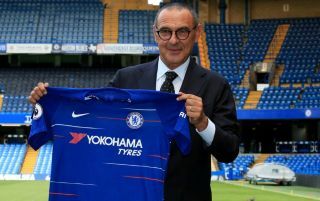 Evening Standard journalist Tom Collomosse told BBC Radio 5 Live that Sarri has a ‘non-aggression transfer pact’ with the Serie A side, meaning he can’t raid them for some of the players he wants. It is not entirely clear which or how many Napoli players Sarri had in mind to poach from his former employers, though he’s already managed to bring Jorginho with him to Chelsea from Naples. There have, perhaps unsurprisingly, been other links with players based at the Stadio San Paolo, with Goal recently suggesting Senegalese centre-back Kalidou Koulibaly could be one player on the Italian tactician’s radar. Another report from the Telegraph last month claimed Sarri’s move to Chelsea could also see him try a move for Belgian forward Dries Mertens – one of the biggest success stories of his time at the club. The 59-year-old successfully converted the winger into a deadly striker, and he could definitely be an upgrade on last summer’s flop signing Alvaro Morata. Collomosse adds that Sarri is looking to sign Juventus duo Daniele Rugani and Gonzalo Higuain, who would certainly make fine options if he cannot bring in Koulibaly and Mertens in those equivalent positions from Napoli.